Happy Monday! I’ve been admiring terrariums for some time now and thought I’d try creating one to liven up a dull corner in our family room. I often like to bring a little life to a room with a plant or fresh flowers. Currently, our family room is painted a deep color and the blinds are often drawn for TV watching, making it difficult to keep any plants alive. A couple years ago, I added a dried boxwood globe I found at Restoration Hardware to one of the shelves and I liked the pop of green it added to the space. I thought a terrarium would repeat this effect, also adding a few other natural elements plus the sparkle of glass. Note: Some links are affiliates. Check out my blog policies. 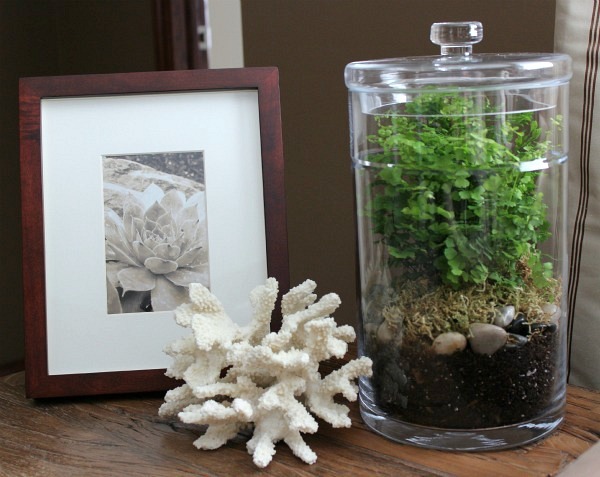 To build your own terrarium, clean the large glass canister and layer the bottom for drainage with about 1″ of gravel. Add a small layer of charcoal and a few inches of sterilized potting soil. 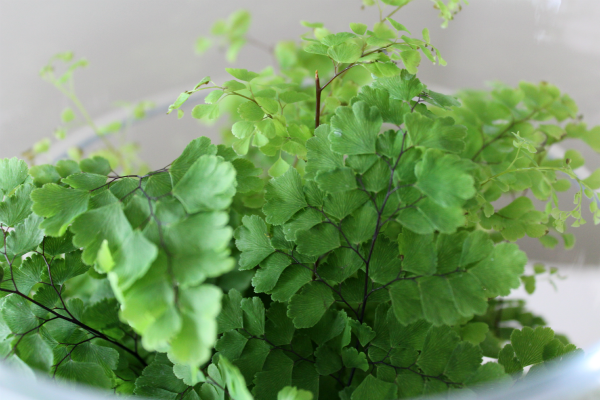 When choosing the type of plant, make sure it’s shade tolerant especially if there’s low light in the room. You also want something that can take the humidity from natural evaporation in the jar. I decided to go with a variety of fern. Brush a bunch of soil from the roots and place it on the soil layer in the jar making sure the roots are covered with a bit more soil. Next, add a few river rocks and a layer of moss. Give the plant a light watering as close to the roots as possible. Wipe the inside of the glass with a lint-free cloth and put the lid on top. Keep out of direct sunlight. I’ve had the terrarium for a few weeks now and all seems good. Every once in awhile, I remove the lid to let a little moisture escape. I’ve only had to water it once due to its own evaporation. What natural elements do you like to add to your space? 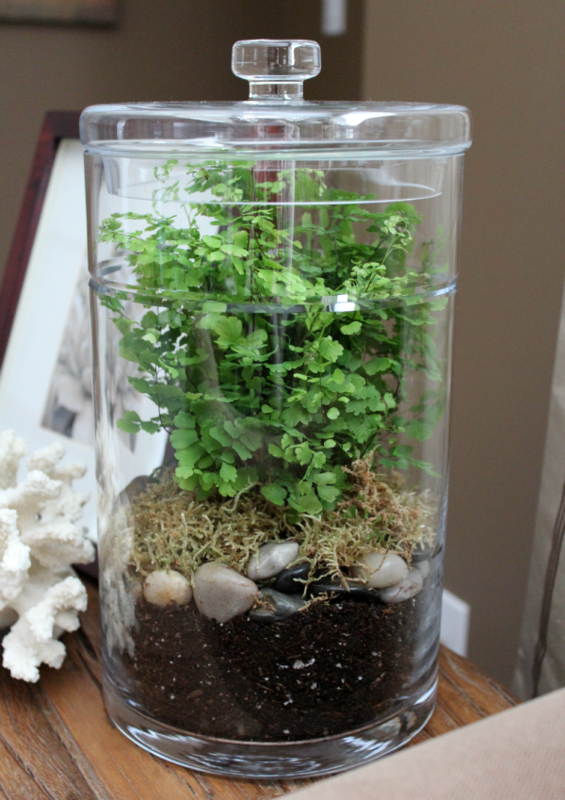 Do you have any tips for keeping a terrarium at its best? « The Orange Fence is Gone! Hi Shauna! I just found your site while looking for DYI terrariums. I love yours and was wondering if you could tell me the name of the fern you chose and if survived. Hi Magda, I don’t recall the name of the fern, but it did survive for a good 6 months or so. The key is keeping it moist, and I’d also select a container big enough that the plant materials don’t touch the side. Good luck! Hi Janet, I found mine at Home Depot in the specialty soil section. I’m not sure if they still carry it. You can also find it through Amazon. Activated Charcoal can also be found at pet shops as a fish tank filter medium.